This page contains our standard sized Superweb swimming pool winter debris covers. If your cover is not one of our standard sizes then you can calculate the cost on our Cover Cost Calculator and see details of how to order. Our winter debris covers are made from a specially formulated durable woven green fabric. The tight mesh design allows rainwater to pass through but keeps the pool water crystal clear as it prevents light getting to the water. The standard winter cover has straps attached to the edge of the material. They are supplied with a storage bag and a 5-year pro rata guarantee. They are anchored as standard using stainless steel, spring assisted “P” anchors. The standard features of the cover consist of a top quality UV stabilised woven base material with anti-chafing strips on all strap positions, large reinforced corners and the stainless steel spring anchors at between 4ft (1.2m) and 5ft (1.5m) spacings. Continuous anti-chafing strips are available at an extra cost. All covers will be made 1ft (30cm) larger than the pool size i.e. we will add the necessary 2ft (60cm) to the length and width of the pool to give the cover size. 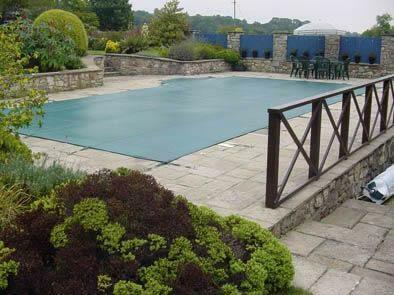 This extra cover material forms a protective layer over the pool, reducing the risk of frost damage underneath and discolouration from leaves and other debris that may fall into the pool during winter. Winter protection is vital for any pool and our winter debris covers offer the perfect solution to keeping leaves and unwanted items out of the pool whilst shielding the pool water, liner etc from what even in the winter can be damaging UV rays from the sun. Our winter debris covers are made from a specially formulated durable woven green fabric. The tight mesh design allows rainwater to pass through but keeps the pool water crystal clear as it prevents light getting to the water. There are two types, the Standard Winter Debris Cover & the Criss Cross Winter Debris Cover. The standard winter cover has straps attached to the edge of the material whereas the top of the range criss cross type cover has webbing straps in one continuous piece that is sewn to the body of the cover and continues across to form the fixing on the opposite side. Thus the straps criss-cross the cover like a web and therefore provide extra strength and durability. Both are supplied with a storage bag and a 5-year pro rata guarantee. They are anchored as standard using stainless steel, spring assisted “P” anchors but an upgrade is available to a stainless steel, spring assisted brass flush fixing. In addition there is also the option to have rubber tensioners instead. Covers can be manufactured to accommodate ladders etc intruding into the pool as well as step sections outside the pool. All varieties of shapes and sizes can be supplied. All covers are made 1ft (30cm) larger than the pool size i.e. add 2ft (60cm) to the length and width of the pool to give the cover size. This forms a protective layer over the pool, reducing the risk of frost damage underneath and discolouration from leaves and other debris that may fall into the pool during winter.